It’s Time to Prune Your Apple Trees. 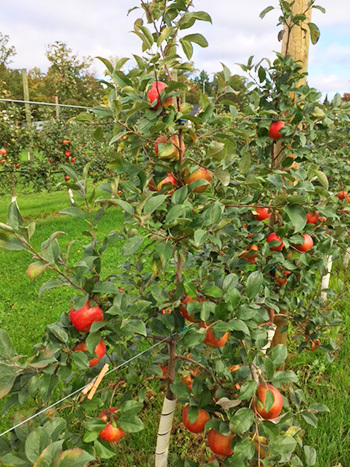 It’s that time of year again; time to prune your apple trees. Why is pruning so important? Encouraging fruit production, air flow, and light penetration. Encouraging fruit production: You will only get fruit on 1-3 year old wood. Air flow: If you don’t prune your trees you will not get good air flow through the tree. You should be able to wave your hat through the tree. This will reduce fungus problems. Light Penetration: Your apples need sun to grow great quality fruit. Gilby’s 4 step process to pruning your trees. Collect the tools that you will need. 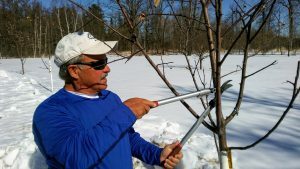 We use a few different bypass pruners the small pruners for small branches and the larger pruners for larger branches. Bleach… we use about a ½ cup of bleach per gallon of water. Make sure to rinse your pruner to kill any possible bacteria (fire blight) from your pruner before you go to the next tree. This is very important!!!!! Oil your pruners when you are finished pruning. You should only have the main primary trunk as your vertical leader. Cut any vertical water sprouts. Prune the water sprouts back to where they attached to the branch. Cut just above the hormone ring or collar; do not cut the hormone ring. How many branches do you have coming off the leader? I bet you have way more than you should. Go out and count them, do you have more than 10? If so, you have way too many branches coming off the leader. We recommend that you only have 4 or 5 branches between 3’ off the ground and up to 5’ off the ground. This is called the lower whorl. You can have another 4 or 5 branches between 5’ and 10’ off the ground. This is called the upper whorl. When thinning out the tree if you have too many branches coming off the leader you should identify what branches you need to remove. If the branches have an acute branch angle anything less than 45 degrees needs to be removed it is a very weak branch angle. In a perfect world you should have your 4-5 lower branches facing different directions 1 facing north, 1 facing east, 1 facing south, and 1 facing west. Do the same for the 4-5 branches in the upper whorl.